I founded my law office, John V Martine Attorney At Law, LLC, in Winfield, Alabama, in order to help people resolve their most complex legal concerns, including personal injuries. For more than 10 years, I have been by the side of clients hurt by catastrophic car accidents, slip and falls and nursing home abuse or neglect. I also take on wrongful death cases, insurance claims, Social Security Disability and workers' compensation matters. The first priority at my law office is to ensure clients receive the immediate medical treatment they need. Then, I negotiate with insurance companies to try to obtain the maximum possible compensation. In the event discussions do not lead to a favorable outcome, I prepare my clients for the trial process and represent them vehemently in court. Additionally, I provide defense for criminal charges such as child neglect and driving under the influence of alcohol. 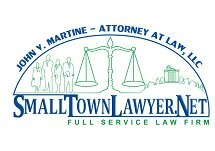 John V Martine Attorney At Law, LLC Winfield Alabama, welcomes clients from the greater counties of Marion, Fayette and Lamar. My law office offers a free initial consultation and accepts credit cards as payment. My firm is a debt relief agency. I help people file for bankruptcy under the U.S. Bankruptcy Code.